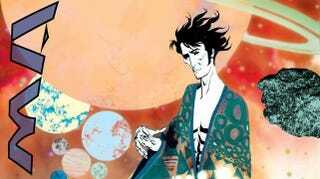 Looking forward to issue #2 of Neil Gaiman's The Sandman: Overture prequel series? Well, good news — you're going to be looking forward to it for the next four months! DC announced the much-anticipated second issue has been pushed back from a December release to February 2014, for unknown reasons. If it makes you feel any better, 1) I'm certain DC didn't want this to happen, because The Sandman: Overture #1 was one of the year's best-selling comics, and four months is a terrifyingly long time for to bring out the next issue, but also 2) J.H. Williams III's interior artwork for #1 was gorgeous, and frankly, if it takes four months for him to draw an issue, I say let him. He was born to illustrate Sandman. The 6-issue comic was supposed to come out every two months, meaning issue #3 was originally set to arrive in February, but has now been pushed back to April 2014... at the earliest. Honestly, it might be easiest just to wait for the trade... say in late 2015 or so.